Ever thought about bringing a piece of New York City home with you?On my quest to find souvenirs that stand out from the snow globes sold in Times Square, I encountered a table displaying antique-looking jewelry and art in front of St. Anthony’s Church in SoHo. 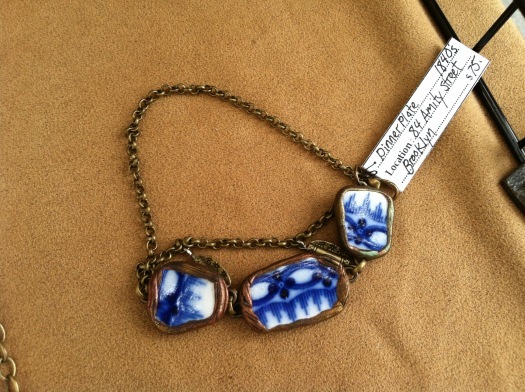 These antique beauties are jewelry made from old artifacts dug up around New York City, by artist, Scott Jordan. Scott spends his days digging through wells and landfills finding fragments of china, porcelain figures and furniture to be restored and made into art. His business partner, Dolhathai Srijamcharoen takes Scott’s findings, and transforms them into beautiful one-of-a-kind jewelry. Each piece of jewelry comes with a tag telling where the piece was found, what year it was from, and the artifact it was once apart of. Jordan treats New York City like one big scavenger hunt; the way people should treat it. It can be easier to stick with what you know, but sometimes taking a different direction can lead to some amazing finds. If you want a souvenir that’s apart of New York history, this is perfect. Aside from getting a timeless necklace, it definitely beats the cliché t-shirt . You can get a million I Heart NYC T-shirts just about anywhere, but the necklaces made by NYC Artifact Art are original works of art. Weather permitting, NYC Artifact Art can be found Sunday at the Greenflea Market, Friday and Saturday at St. Anthony’s Outdoor Market and other markets during the holiday season. For dates and times you can always check out NYC Artifact Art’s website.